Ever since the 606 was completed in summer of 2015, residents have speculated about possible extensions of the popular trail. The Trust for Public Land, the private partner that spearheaded planning and construction of the 606, has always stated that future additions to the trail would be dependent on additional funding. Now it appears that Chicago-based developers Sterling Bay are interested in taking the reins of a proposed extension of the 606. In an interview with Crain's, Sterling Bay Managing Director Andy Gloor revealed that the developer would like to extend the trail east to the former site of the A. Finkl & Sons steel plant. According to the interview, Sterling Bay is in the process of acquiring the parcel of riverfront land in Lincoln Park, which it hopes to redevelop as a mixture of commercial, retail and residential space. 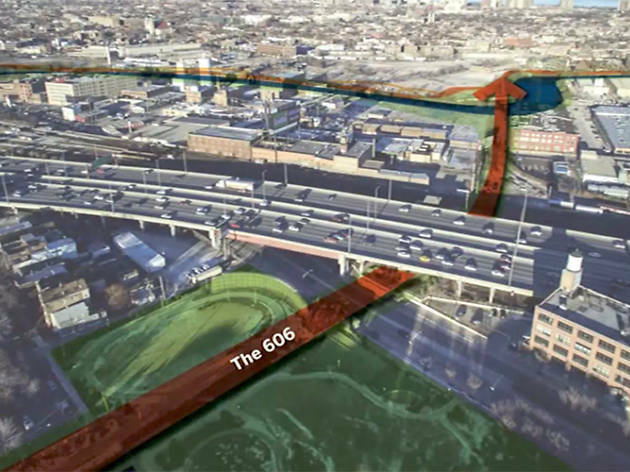 The 606 currently ends at Ashland Avenue, so any extension of the trail to the east would have to navigate the Kennedy Expressway, a set of Metra tracks and the Chicago River. Chicago 2nd Ward Alderman Brian Hopkins supports the extension of the trail and revealed a tentative plan (pictured above) in May that seems to mirror the path proposed by Sterling Bay. 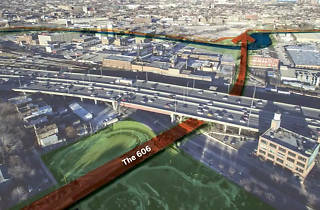 Hopkins also identified an existing, unused bridge that could be repurposed as a new section of the 606. While nothing is set in stone yet, Sterling Bay's interest in extending the 606 demonstrates just how valuable the elevated path has become. The trail has proven to be an attractive and widely used addition to the neighborhoods it passes through, driving up property values and creating a new way for individuals to navigate the city. A development with direct access to the trail could garner interest from high-profile tenants with deep pockets—a fact that Sterling Bay is surely hoping to capitalize on.